Home > Welcome to Winston-Salem! If you thought this site was about Winston Churchill, I’m sorry to say you’ll be disappointed. If, on the other hand, you’re more interested in learning more about our beautiful city of Winston-Salem, North Carolina, nestled between the Blue Ridge mountains and the nearby cities of Charlotte and Raleigh, you’ve come to the right place. Highlights from our site include restaurant reviews, top community events, travel tips, local news, local celebrity profiles, history, the arts and more. 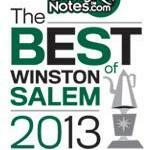 Year after year, MyWinston-Salem.com is proud to be voted by you, our readers, as one of the best local blogs, Facebook pages and Twitter feeds for those who want to be in the know on all things WSNC per the Smitty’s Notes awards! With this vote of confidence from you, our readers, we hope you’ll find something to make you fall more in love than ever with our town of Winston-Salem. What’s so Great About Winston-Salem? What’s so great about Winston-Salem? That’s what you’ll find out by browsing around the various pages of this website and visiting our Facebook page. You’ll learn that Winston-Salem is a green city, boasts one of the top Farmer’s Markets in the country and it is on the top 10 list of places with low cost of living and high job growth – optimal for these trying economic times. 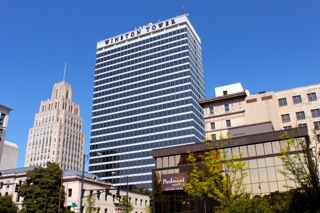 Winston-Salem was North Carolina’s primary city in its heyday, with booming textile industries and tobacco fields stretching as far as the eye could see. However, in recent times, the Arts (think RiverRun International Film Festival and the famous NC School of the Arts) as well as the biotech and healthcare industries, have taken center stage. Nevertheless, you won’t want to miss out on a visit to Old Salem or Bethabara, where you’re taken back in history to a time of horse-drawn carriages, bakeries, and more – in the day that the German Moravians (don’t miss out on the famous Moravian cookies – baked by Dewey’s – the world’s thinnest (and we like to think tastiest) cookie!). And then of course, there is the beloved tennis scene – three Davis Cups and two years so far of ATP U.S. Open stops for the Winston-Salem Open were hosted in Winston-Salem in the past decade, and public courts are meticulously kept and frequently resurfaced. And We Love North Carolina too! Winstonites, as we like to call ourselves, love not only Winston-Salem – but the surrounding countryside as well. From the Yadkin Valley Wine Country – a growing and increasingly respected wine region – to the NASCAR events and DASH baseball, there’s something here for everyone. Go hiking in the Appalachians, biking along the Blue Ridge Parkway, and skiing or snowboarding in the winter. Whatever your interest, we’re confident you’ll find your niche. If you’re from out West, you’ll be blown away by the Southern hospitality. Hopefully after some time here, you’ll also come to love Winston.